One of the chief ways the Gospel has been most harmed in our day, is in how it is often presented as a cure for difficult circumstances, rather than a cure for sin-sick souls. [[SLIDE]] This is David Berkowitz – Some of you might recognize him as “The Son of Sam Killer”. He is currently serving 6 consecutive life sentences for murdering at least 6 people and injuring many more. If the Gospel we preach isn’t as relevant to someone like a David Berkowitz, serving 6 consecutive life sentences for murder, someone whose circumstances can never change – as it is to our neighbor – then we have competing Gospels. The Gospel must be relevant to each PERSON. No matter what their circumstances. In all places, at all times and under all conditions. So it was in 1987 – David Berkowitz believed the Gospel and was born again. But he will never leave prison. Never. It is this approach to the Gospel that forms so much of the core or Peter’s letter to his hearers. And we’ll come back to that before we are done. [[SLIDE]] You’ll remember last time, we began looking at Christians living supernaturally under the authority of human government. That was the 1st of 5 spheres of life Peter is addressing. In each, he is teasing out what it means to live out our Royal Priesthood in this present world. And certainly counter-intuitive to our natural ways of doing things. It is an awesome and expansive way of seeing and living life. One which can only be accomplished by living in the power of the indwelling Spirit of Christ. We must keep in mind this is not a way TO BE SAVED, but the way of life those who are already IN CHRIST, by saving faith, are called to live. It is a prophetic life. It speaks out into the World. Life which is itself a living message the World seldom grasps. One which will have to await Christ’s return to be fully validated. This is our purpose. This is our mission: To make God known in the saving work of Jesus Christ – by living His life out in the power of the Spirit. And I dare say if we give ourselves to that – we won’t have much time or energy left over to entangle us in host of other things. [[SLIDE]] So this morning, we want to look at the second sphere of life Peter mentions. 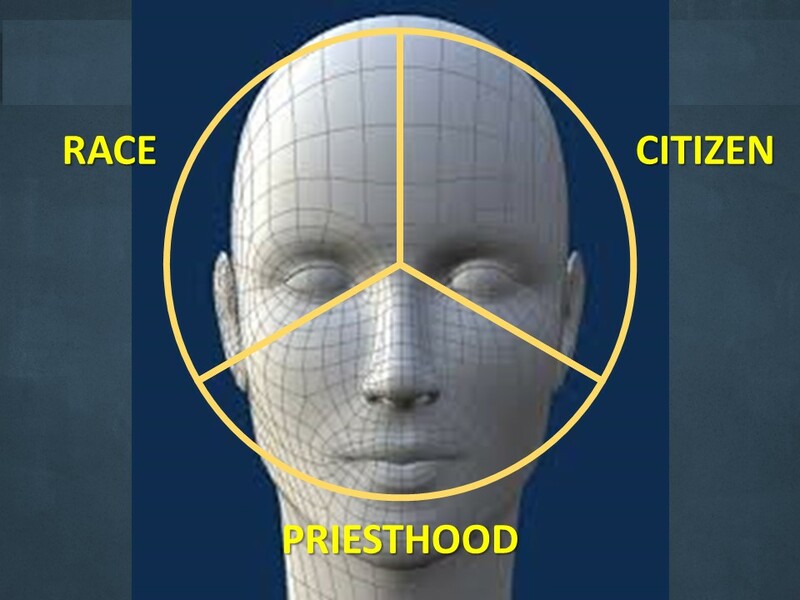 What does it look like to carry out our Priesthood in the Workplace? Building off of the previous portion – our relationship to human government – this portion speaks to us in terms of our employment. [[SLIDE]] Peter addresses this portion to “servants” in vs. 18. Servants or slaves were the lowest caste of society. They were also seen as a part of the household. The most powerless and marginalized segment of society. So Peter is making sure that we disconnect ourselves from the social compartments that so often govern us. Instead he elevates the powerless to remember that if they are in Christ – they too, are this Chosen Race, Royal Priesthood and Holy Nation – and even in their supposedly powerless place, can nonetheless carry out God’s divine strategy in the world. One does not need money to serve God well. One does not need social standing to serve God’s purposes. One does not need political clout to accomplish God’s agenda. One does not need to fret about being a minority or without a public voice. One does not need some extraordinary talent or gifting. One only needs to live out the life of Christ where by God’s sovereign appointment He has placed them. Many a Christian says they would do this or that for the Kingdom of Christ if only they had the time, or the money, or the position to be heard, or the gifts to impact others or the personality to engage others, or the intelligence to do this or that or the other thing. [[SLIDE]] Poor Christian, be not dejected, because thou seest thyself out-stript and excelled by so many in other parts of knowledge; if thou know Jesus Christ, thou knowest enough to comfort and save thy soul. Many learned philosophers are now in hell, and many illiterate Christians in heaven. And Peter is saying by The Spirit – those may be good and well in their place – but right now, right where you are, right in your present circumstances, with the gifts and graces you already have, you can “proclaim the excellencies of Him who called you out of darkness into His marvelous light” by the way you respond IN your very circumstances. Under an oppressive, anti-Christian government – live Christ! In a dead end, job with a crummy boss – live Christ! Then he’ll touch on 3 more spheres before he’s done. So what of our text? [[SLIDES]] I. Here’s the SETUP: Servants, be subject to your masters with all respect, not only to the good and gentle but also to the unjust. He envisions some of his readers to be in a slave relationship to some masters who are not only pagan, but also – unjust. Since nearly 40% of the Roman population were slaves, this was a pretty common state of affairs. And unlike our day where one can just look for another job if they don’t like their current boss or employment, these didn’t have that option. As we’ll see, Peter’s word to us here applies even if one CAN jump ship to another job. For the focus isn’t upon changing the situation as much as it is on taking advantage of the situation as one of Christ’s Royal Priests right where we are. Now we must tease out the central thought so that it doesn’t get lost in the details. [[SLIDE]] No matter how unjustly we are treated – we must never use that treatment as an excuse to respond sinfully ourselves. Instead, we are to use it as a platform to display the supernatural grace of Christ in us. Let me repeat that: No matter how unjustly a Christian is treated, we must NEVER use mistreatment as an excuse to respond to it sinfully. Instead, we are to use it as a platform to display the supernatural grace of Christ within us. And I am certain I can hear someone object: But they are thick and stupid and lost and won’t understand it. It will be lost on them. To which the text responds: It doesn’t matter – because Christ takes note. So the SET UP is unjust treatment by someone with power over us. [[SLIDE]] II. And the LENS through which we are to see it is: 19 For this is a gracious thing, when, mindful of God, one endures sorrows while suffering unjustly. It is a “gracious” thing, a display of grace, when MINDFUL OF GOD – we endure sorrow when suffering unjustly. Let us be clear – this is NOT the pagan or religiously mistaken idea that there is virtue merely in suffering. That is not the Bible’s teaching. Only when we endure a certain way – mindful of whose we are, what we are, and why we are here for the sake of Christ! [[SLIDE]] III. He goes on to an EXPLANATION: 20 For what credit is it if, when you sin and are beaten for it, you endure? But if when you do good and suffer for it you endure, this is a gracious thing in the sight of God. There is nothing laudable about taking our licks patiently when we deserve them. Anyone can do that. But when we aim to do our human master GOOD, and in the process STILL suffer – mindful of the God we serve in it – THIS, God takes notice of. This He delights in and commends. [[SLIDE]] IV. Why? Revealed Reasoning. Because of how it mirrors the work of Christ, and how it demonstrates that we are not of this world – but truly serve another master – THE Master. [[SLIDE]] 21 For to this you have been called, because Christ also suffered for you, leaving you an example, so that you might follow in his steps. So this is the example Christ Himself set for us. Our “CALLING”. But once again we must be careful here not to cross over into human religious notions, and attach some form of virtue to suffering for suffering’s sake. That is not Peter’s point. No. He never let other’s sin against Him, lead Him into responding sinfully. [[SLIDE]] a. Sinned against He didn’t try to deflect suffering by playing both sides: neither was deceit found in his mouth. [[SLIDE]] VI. RESPONSE – So what DID He do? [[SLIDE]] but continued entrusting himself to him who judges justly. [[SLIDE]] VII. PAYOFF: [[SLIDE]] 24 He himself bore our sins in his body on the tree, that we might die to sin and live to righteousness. By his wounds you have been healed. [[SLIDE]] He died bearing our sins on the tree, SO THAT we might be freed from responding to sin in sinful ways. [[SLIDE]] Essential to our salvation is His bringing us to a place where our motivations are not rooted in reacting to the sinful acts of others – but to the display of His excellencies IN us. Showing that we have not only been forgiven of our past anger, retribution, revenge and sinful responses to sin – we’ve been redeemed from responding that way at all – in stark contrast to the World and Human nature! This is the privileged life of His Royal Priests. Jesus did not respond to the abuse of others, because He was about bigger business than that. And Peter is calling us to live that way to. To move beyond the mere external circumstances, to accomplish a spectacular and supernatural work in the world THROUGH the way we endure those circumstances. It is to find our ministry in living Christ out in the midst of and in response to the darkness around us. It is here we come face to face with the real wonder of our salvation, and the atoning work of Jesus on the Cross. There is an old joke about what you get when you play a Country Western son in reverse: You get your girl back, your truck back, your job back, your house back and your dog back! Now that’s great when we are joking about a genre of music. But how desperately we need to avoid letting presentations of Christianity devolve into that same sentiment. Just come to Jesus and your marriage will be fixed. Your kids will grow up healthy and marry well. Your finances will miraculously turn around and every bad medical diagnosis will be reversed. However our gracious Lord may bless us in any of these circumstances, it is to demean the Cross and the work of Christ to reduce it to being the means to live the best version of the American way of life. He died to save us from our sins! He did not die to give us better jobs, more harmonious homes, loving spouses, a sound economy or a stable government. Jesus’ death on the Cross was to free us both from the penalty of sin – from its dominance in our lives. To set us free from its power. That we might die to sin in all of its forms, and irrespective of its provocation. So that we might commit no sin when abused. So that we might not use deception to avoid difficulty. So that we might not revile those who revile us. So that when we suffer, we might not threaten in response. So that we – like Jesus, might entrust ourselves to His justice, not needing to bring it about ourselves by any sinful means. And in the process – to accomplish God’s own agenda in the world through the Gospel. [[SLIDE]] To proclaim the excellencies of Him who called us out of darkness, into His marvelous light! This is what Peter means when closes this segment by saying “by His wounds you have been healed. By having been “healed” by the wounds of Christ. vs. 25 – He means through Christ’s substitutionary death, we have been restored to right fellowship and relationship to God the Father. Brought back under the oversight and care of the Shepherd of our souls. To serve Him in joy above every earthly institution and power externally and especially INTERNALLY. To be other-worldly in Christ – in this fallen, sin-sick world. To the glory of our God and King – Jesus Christ. Now THAT’S – the Gospel we preach. The Gospel we are called to live. The Gospel which saves us from sin – both its penalty, AND, its power.